The Jokhang Temple, situated in the heart of Old Lhasa, it houses Tibet's most precious religious relic, a golden Shakyamuni Buddha which was brought as a gift by the Chinese Princess Wen Cheng on the occasion of her wedding to the Tibetan King, Songtsen Gompo. Surrounding the Jokhang Temple is the bustling Barkhor Market place, which is the religious and social focus of Lhasa. Later in the day visit the Potala Palace, this legendary palace built atop a single hill is synonymous with Tibet by the first foremost king Songtsen Gompa. The 5th Dalai Lama expanded it to its present structure during the 17th century. This 13 story 1000 room citadel served as the headquarters of the former "Monastic-state" of Tibet and was home to successive Dalai Lamas, who from the latter half of the 18th century used it as their Winter palace. And largest and second largest monasteries Depong and Sera, university and Buddhist learning center. This morning you will fly for about an hour over the panoramic Himalayan Ranges to the capital of Tibet " Lhasa" - at an altitude of 3,650 mt, is situated on the north bank of Kyichu River. Lhasa in Tibetan means "Place of the Gods", the residence of the Dalai Lama. Life is unhurried, its people jovial and yet remaining staunchly independent. On arrival you will be met by the local representative and transferred to your respective hotel. Balance off the day free to relax and acclimatize to the altitude. Today we will visit the Jokhang Temple, situated in the heart of Old Lhasa, it houses Tibet's most precious religious relic, a golden Shakyamuni Buddha which was brought as a gift by the Chinese Princess Wen Cheng on the occasion of her wedding to the Tibetan King, Songtsen Gompo. Surrounding the Jokhang Temple is the bustling Barkhor Market place which is the religious and social focus of Lhasa. Later in the day visit the Potala Palace, this legendary palace built atop a single hill is synonymous with Tibet by the first foremost king Songtsen Gompa. 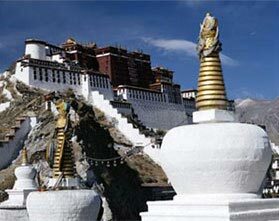 It was expanded to its present structure during the 17th century by the 5th Dalai Lama. This 13 story 1000 room citadel served as the headquarters of the former "church-state" of the Tibet and was home to successive Dalai Lamas, who from the latter half of the 18th century used it as their Winter palace. This morning we will drive to Drepung Monastery, 8 Kms west of Lhasa - said to be the largest monastery in the world, housing over 10,000 monks. It was founded in 1416 by the disciple of Je Tsonkhapa, founder of the Yellow Hat Gelukpa sect of Tibetan Buddhism. The second, third and fourth Dalai Lamas lived and were entombed here. Drepung in Tibetan means "Richmond". Also visit the Sera Monastery, 5 Kms north of Lhasa, Sera setting is one of Lhasa's prettiest monasteries. Once a community of more than 5,000 monks resided here and was virtually extinguished by the Chinese. The restored monastery sits below the brow of hill on which tsongkhapa built a hermitage and spent several years mediating. One of the monks disciples began building Sera in 1419, completing it a few years later. Hard & Soft drinks, all expenses of personal nature, Nepal re-entry visa fee, Airport Tax, Charge for photography, Travel Insurance, Emergency evacuation, Visa fee, Urgent Visa Fee & Airfare.